Create a "New Meeting" in Outlook, select the "To:" field and type in "HR-USB-Room" (for Room 214) or "USB-Room" for other USB rooms. The list of available rooms in USB will populate. Double click to select the room you want, add the subject, start/end date and time, then click send. For Conference Room 214 you will receive a response from one of our "room approvers". For conference rooms 207, 209, and 211, you will receive an automated approval if the space is available or a denial if the room is occupied. To gain entry into the Conference Room(s) please see your department administrative representative. Thank you for your interest in using USB Room 214. To better serve everyone renting our rooms, we have designed policies to ensure an easy, streamlined way to schedule the rooms as well as procedures to maintain the rooms in their default condition. Before using rooms 214, read our Room Use Policies below. These policies are nonnegotiable and have been designed to improve your experience. Please read and follow them out of respect for all of your colleagues who also use these rooms. Thank you and we hope you enjoy the use of Room 214. Room 214 is available for reservation by campus employees and departments between 8 a.m. - 5 p.m., Monday - Friday. Please note: reservations must be for business purposes only and include 15 or more people. For meetings of fewer than 15 people, please utilize the spaces assigned in USB for small meetings - 207, 209, 211, 305, 309, 407, 505, and 507. Room 214 has modular furniture. It seats 30-35 in a classroom style; more in a lecture style set-up. Reservation requests must include an approximate number of expected attendees and a description of the event/meeting. For reservations that have food OR more than 50 people at the event, Facilities Management (FM) custodial services must be requested for the event in order to ensure proper trash removal, cleaning, and facility supplies: (https://www.fm.arizona.edu/#/specialEvents). Forward the confirmation of the request to us before the event date. Failing to contact FM when necessary will incur a penalty of $25. Human Resources reserves the right to accept or refuse a reservation or to cancel any booking as needed. Tables and chairs as noted in the diagram below. Any extra chairs should be left in the closet between 214 and 216 - ask for a key in room 217 if the closet is locked. Return the key for 214 to room 217. Lock the doors to 214 before leaving. Log off the computer and turn the monitor off. Leaving the room out of order will incur a penalty of $25. Please send cancellations in advance. No-shows will be charged a penalty of $25. A violation of these policies may result in denial of future reservations of this room. NOTE: Facilities Management has requested organizers who have food AND/OR more than 50 people at their event, must fill out the FM form (https://www.fm.arizona.edu/#/specialEvents ) to request custodial services for your event. Please be specific regarding the space you will be using. You must forward the confirmation of the request to us. 1. The cleaning schedules. Not all rooms are cleaned every day, so we need to inform custodial when an event falls outside of their regular cleaning schedule a) so that your event has a clean space and b) so that trash doesn't get backed up if there are two back-to-back reservations. 2. Custodial likes to be informed if there is food involved with events (snacks and water do count) so they can be prepared with extra bins or clean-up if needed. 3. We need to be able to ensure bathrooms are stocked with supplies. Custodial accounts for regular wear and use of restrooms based on the occupancy of the building, but the demand for supplies increases when outside groups utilize our spaces. By filling out the special events form, the custodial team knows whether to stock anything extra depending on the requests they receive. If we do not have confirmation of a Facilities Management custodial request, we may cancel your reservation. Please direct any questions to hrrsvp@email.arizona.edu. As stated in the policies above, when you are done using Room 214, leave the tables in the arrangement shown in the diagram below. 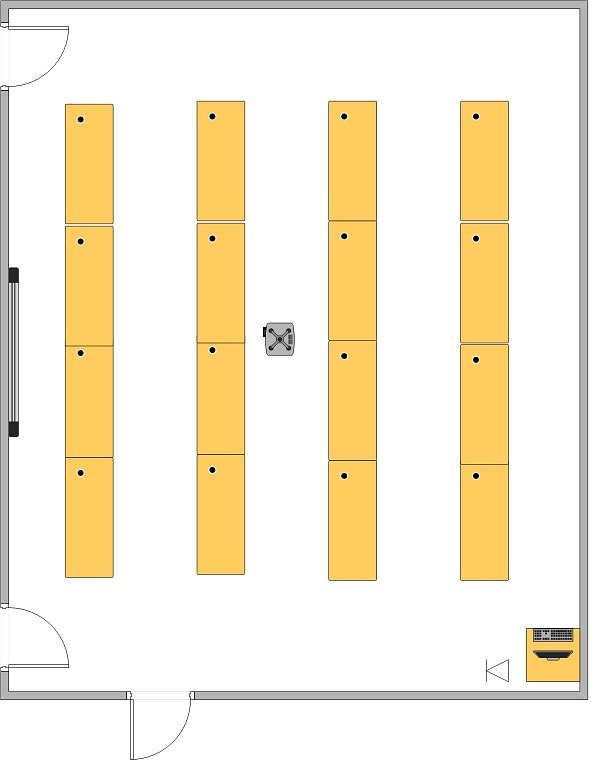 Additional tables can be placed in the closet in between 214 and 216. For keys to 214 and to the closet, come to 217. USB Room 214 also has an overhead projector, a projector screen, a PC, and a telephone jack available for use.